When I was asked to host this round of TGRWT, I was looking for ingredients that were accessible to everyone around the world at this time of year. I also wanted something that would give those of us in the Northern hemisphere a bit of comfort food during these cold months. One participant deemed the ingredients tame (now that's not something people usually label my choices as! ), but tameness is all in how the ingredients are used. And with that we plow forward. Below are the diverse dishes that were created. 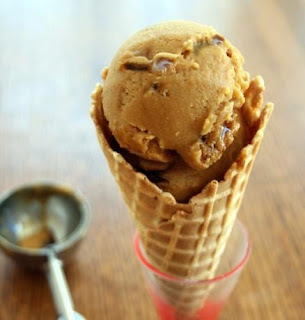 With just enough sweetness to counteract the high level of salt in the soy sauce, the caramel ripple adds bursts of bright flavor, livening up the smooth, musky malt ice cream. An odd couple, perhaps, but they really do create a harmonious symphony of flavor! My colleagues (no whiskey drinkers) could not detect the whiskey nor the kecap manis but said the fruit cake was delicious! The resulting sauce was really intense, thick and somewhat pungent. I’d forgotten just how rich barley malt tastes, and with the added soy sauce, I worried that this flavor combination would overpower any dish I put this sauce into. Throwing caution to the wind, because I’m crazy like that, I decided to just go with the richness, and added red wine to the sauce. 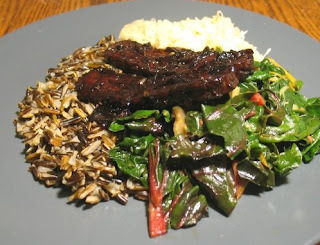 Originally I was going to make some sort of braised tempeh dish, but the barley malt was so thick (and strong-tasting) that a reduced glaze worked a lot better — and even that was pushing it. Seriously potent stuff. The sauce was quite potent. First you get the salt from the soy, then the fresh notes from the lemon and then the bitter from the beer. 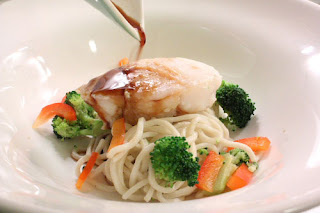 I felt that the malt beer enhanced the umami flavour of the soy sauce and together with the honey, vinegar and lemon juice made for a complex but well balanced sauce that went well with the dish. 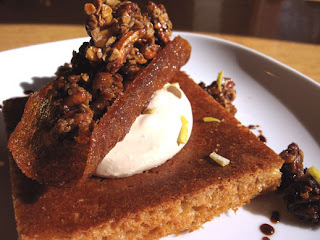 Malt cake topped with soy creme, a soy sugar tube filled with savory granola. Every element stood on its own, and combined I thought they were outstanding. In particular the granola was perfect - just a bit sweet and a bit salty, accentuated by the use of French Sel Gris (grey salt). We both nearly cleaned our plates, but don't think we could've eaten any more of the cake. Dan left his last bite of cake behind, as he ran out of ice cream to balance it. We cooked several different versions of this dish, adjusting the amount of roasted barley each time. Too much roasted barley was too overpowering, not enough was not interesting enough. The final addition of salt (both in the coating and a sprinkling of French Sea Salt on the plate) really added to the flavor. We thought that the sweetness of the malt and the saltiness of the soy were essential partners. The balance that we struck with the roasted malt helped to make a number of the darker flavors come out in the soy. The beer sorbet was a pleasant surprise! 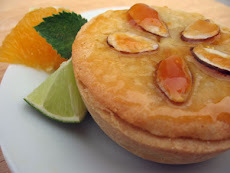 Very creamy texture, perhaps a little on the soft side, but the gelatin helped maintain structure. The flavor was sweet, savory and acidic at the same time. The melon with soy sauce however was not so great. 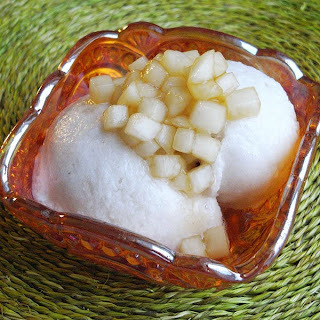 The leftover beer sorbet will be served with lemon and lime marinated melon in stead of the soy sauce. No weirdness to get the head around, no overpowering element to try to get the other ingredient to stand up to. They really do "go really well together". My goal was to do this challenge and make it good enough to serve to a guest and in the end I must say I would for sure serve this to anyone who could get over the initial shock of soy sauce in a dessert. If there are any late comers, just send me your entry and I'll get it posted. Great stuff everybody. This was a fun round. Creative entries! I sure wish I could taste it all. Reading the entries makes me think that maybe I should try making a sorbet with malt syrup instead of beer? And perhaps try to make a soy sauce syrup (and omitt the melon as it has a pretty marked flavor). Thanks for lots of inspiring dishes. I planned to join this time, but just couldn't get around to do it. Hopefully, I'll go for the next one. Good work, Rob.